Venise (Italie): An exorcism of a vampire ? 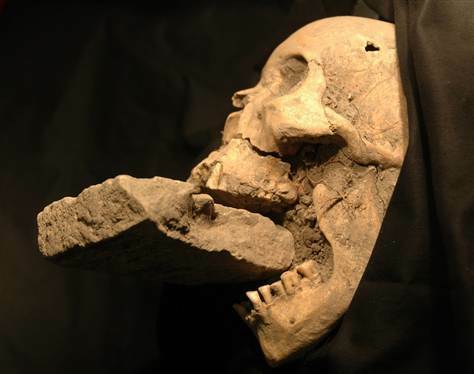 Matteo Borrini / Live Science - The skull of the "vampire of Venice," found in a mass grave with a brick stuck in its jaw. What may have been an exorcism of a vampire in Venice is now drawing bad blood among scientists arguing over whether gravediggers were attempting to defeat an undead monster. The controversy begins with a mass grave of 16th-century plague victims on the Venetian island of Nuovo Lazzaretto. The remains of a woman there apparently had a brick shoved in her mouth, perhaps to exorcise the corpse in what may have been the first vampire burial known in archaeology, said forensic anthropologist Matteo Borrini of the University of Florence in Italy. Vampire superstitions were common when plague devastated Europe, and much, if not all, of this folklore could be due to misconceptions about the natural stages of decomposition, Borrini said. The recently dead can often appear unnervingly alive. As the corpse's skin shrinks and pulls back, for example, hair and nails may appear to grow after death. The remains of the woman were apparently wrapped in a shroud, based on the position of her collarbone, Borrini suggested. A corpse might appear to have chewed through its shroud because of corrosive fluids it spewed as it decayed, perhaps frightening gravediggers into thinking it was a vampire. Vampire myths link the monsters with contagions, and the plague ran rampant in Venice in 1576, killing as many as 50,000 people, nearly a third of the city, including famed Renaissance artist Titian. The gravediggers that ran across this corpse may have wanted to prevent a vampire from ravaging the city further with pestilence, Borrini and his colleague Emilio Nuzzolese suggested in the Journal of Forensic Sciences in 2010. The "vampire" has since been discussed on Italian national TV and a National Geographic documentary. However, now other researchers are openly deriding this claim. Where some might see an exorcism, these researchers see a brick accidentally falling into a skull's mouth. "I find surprising that the reviewers of an important journal such as the Journal of Forensic Sciences had given permission to publish the article of Nuzzolese and Borrini with inadequate scientific evidence to support their hypothesis," physical anthropologist Simona Minozzi at the University of Pisa in Italy told LiveScience. To start with, photos of the site where the purported vampire was found show her remains were surrounded by stones, bricks and tiles, Minozzi said. They also note the jaws of corpses often gape open, allowing any number of items to fall in — for instance, they note a skeleton with a thighbone in its mouthwas found in the cemetery of Vecchio Lazzaretto in Venice. They also note there is no clear evidence of a shroud, as coffin walls might also explain the position of the collarbone. They add that the legend of the so-called nachzehrer, or " shroud-eaters," were apparently tightly confined to the East German region and not Italy. Minozzi and her colleagues detailed their argument in the May issue of the Journal of Forensic Sciences. Minozzi called the vampire idea "nonsense." "Unfortunately, this is a common practice in the last few years in Italy," she said. "This is probably due to the strong cutting of funds for research in Italy, so researchers seek to attract attention and money through sensational discoveries that often have little to do with science." Borrini and his colleagues strongly rebut the argument over their analysis. They discussed how the physical details of the site supported their interpretation in a response in the May issue of the Journal of Forensic Sciences, and that while the legend of the nachzehrer was found in Germanic areas, Venice was a crossroads during the epoch in which such legends from distant lands might have circulated. "Regarding the criticism of my Italian colleagues, I have to admit that it's a quite unpleasant situation," Borrini said. "It seems that the main reasons of the interest in my research is its mass media success. Well, I want to be clear regarding this — I never looked for the media."